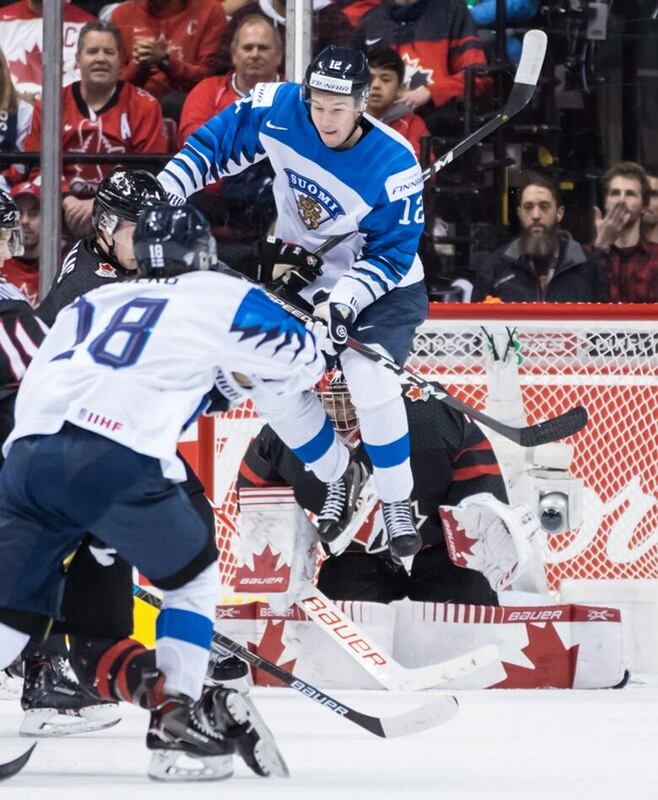 Toni Utunen scored 5:17 into overtime as Finland shocked Canada 2-1 on Wednesday in a dramatic quarter-final at the world junior hockey championship. It wasn't just Canada's junior hockey team that was devastated Wednesday night — it was the entire country, says defenceman Ian Mitchell. 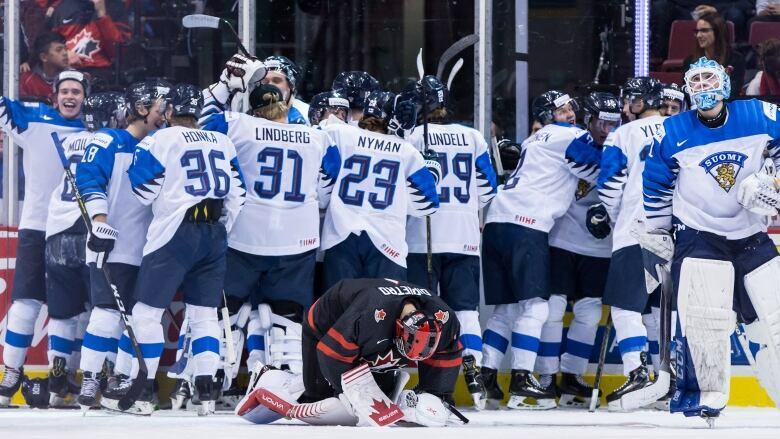 The defending champions were ousted from the world junior hockey championship after a dramatic 2-1 overtime loss to Finland. It's the first time Canada has not won a medal when hosting the tournament and only the second time in 21 years that Canada will not play for a medal at the world juniors. "It's heartbreaking for all of us and the whole country too," Mitchell said after the loss. "You just wish that at the end of the day we are putting on the gold medal but we weren't able to do that." Vancouver Canucks prospect Toni Utunen scored 5:17 into the extra period. "I am just starting to realize what I just did," said Utunen. "It felt amazing. It was my first goal this season, a huge goal for me and even bigger for our team." Canada was up 1-0 with less than a minute to go in regulation, thanks to Mitchell's second-period goal. Finland forced overtime at 19:13 of the third period after Canadian defenceman Ty Smith fell in the corner, allowing Eeli Tolvanen to put a shot off the outside netting of Canada's goal. It rebounded back to him and Tolvanen's second shot bounced off Aleksi Heponiemi's ankle and squeaked past Canadian goalie Michael DiPietro and into the net. "It's a goal from below the goal-line, from behind the net. It doesn't happen really often in hockey," said Maxime Comtois, Canada's captain and the only player returning player from last year's gold-medal winning team. "Canada is never expected to go that early," said Comtois. "But it was a good battle out there. This tournament is about a fine line between winning and losing. Sometimes a game is all about inches and we got our chances and they found a way to get that one." Canada was last ousted from the tournament's quarterfinals in 2016 in Helsinki, also by Finland, which went on to win the gold medal that year. Defenceman Noah Dobson had a wide open net in front of him in overtime but his stick snapped in half as he tried to one-time Cody Glass's pass. Within seconds Utunen had scored the game-winning goal. "That's hockey, little bounces and plays that sometimes don't go your way and other times they do," said Mitchell. "It's cliche but it's a game of inches, if the stick doesn't break we win the game, just tough to have that happen to eliminate you from this kind of tournament." Comtois, an Anaheim Ducks prospect, had Canada's team's best chance in overtime with a penalty shot after defenceman Evan Bouchard was hauled down. The shot smashed into the pads of Finnish goalie Ukko-Pekka Luukkonen. "I was going with my move and trying to shoot," said Comtois. "It's not the first one that I missed and it's not going to be the last one. It has to hurt, but if I get one more chance later in my career, I have to be ready and dig in to get it in." Luukkonen made 23 saves for Finland (2-1-0-2). DiPietro stopped 32-of-34 shots in net and was named the player of the game for Canada (3-0-1-1). The Vancouver Canucks prospect said hearing the crowd of 17,047 break into chants of "Dee-pee-et-ro!" multiple times was special. "But at the end of the day, winning's more important and we didn't do that today," he said. "The only thing that mattered to me was winning and we came up short." After the game, Canadian coach Tim Hunter told his team that he was proud of how they played. "They came together, played, compete as hard as they did. That was a hell of a hockey game," he said. "It's a tough pill to swallow but you just reflect on what you feel you could have done better as a player or a coach, what you felt you did well as a player or a coach. That's how you get better." Finnish coach Jussi Ahokas said winning in Vancouver in front of a crowd packed with Canadian fans was extra special. "As a coach there is no better situation in the world, to play against Canada and win them in their home soil," he said, adding that the game kept everyone on the edge of their seats. "Everything, a [penalty shot] in overtime and then you win yourself. You can't really write better drama than that." Finland will now face Switzerland in the semifinals after the Swiss upset Sweden 2-0 earlier Wednesday. In the tournament's round-robin phase, Finland had a pair of wins over Slovakia and Kazakhstan while Canada put up a trio of wins before losing 2-1 to Russia on New Year's Eve. The Canadians also dropped a pre-tournament matchup with the Finns 5-2. All of the teams still in the tournament will have Thursday off before the semifinals kick off in Vancouver on Friday.